Thu., 27 Feb. - Thu., 5 Mar. Thu., 17 Oct. - Tue., 29 Oct.
Wed., 3 Jul. - Wed., 17 Jul. Wed., 14 Aug. - Thu., 29 Aug. Thu., 4 Jul. - Sat., 13 Jul. See all 28 properties in Greater Fredericton Intl. Situated in Oromocto, this hotel is within 2 mi (3 km) of Oromocto Tourist Bureau, Kings Arrow Arena, and Gage Golf and Curling Club. Wilmot Bluff Lighthouse is 2.6 mi (4.2 km) away. 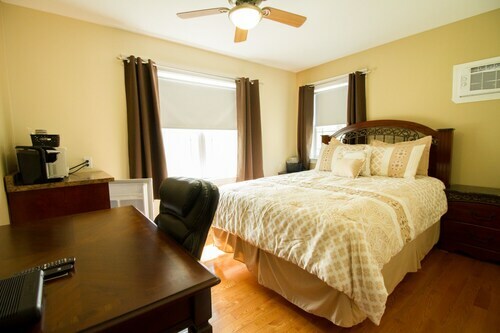 Situated in Lincoln, this bed & breakfast is within 9 mi (15 km) of Regent Mall, University of New Brunswick, and Gallery 78. Fredericton Botanic Garden and Officers' Square are also within 12 mi (20 km). 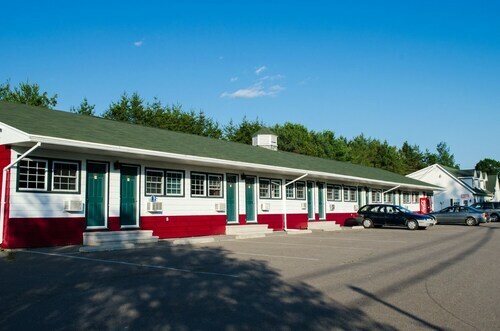 Situated near the airport, this motel is within 6 mi (10 km) of Oromocto Tourist Bureau, Kings Arrow Arena, and Gage Golf and Curling Club. University of New Brunswick and Wilmot Bluff Lighthouse are also within 9 mi (15 km). 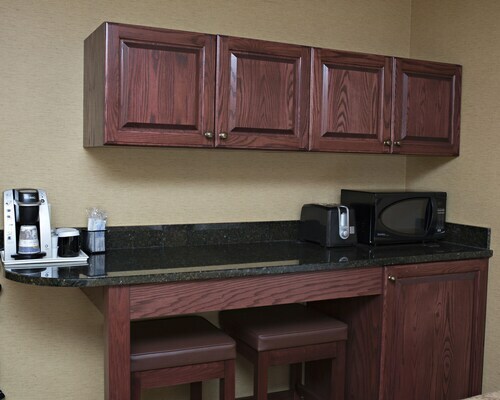 Situated near the airport, this hotel is 3.1 mi (5 km) from Reading Street Park and within 6 mi (10 km) of University of New Brunswick and Grant Harvey Centre. Bill Thorpe Walking Bridge and Chapman Field are also within 6 mi (10 km). Located in the heart of Fredericton, this eco-friendly hotel is within 2 mi (3 km) of Carman Creek Golf Course, Hyla Park Nature Preserve, and Carleton Park. Bill Thorpe Walking Bridge and Gallery 78 are also within 3 mi (5 km). 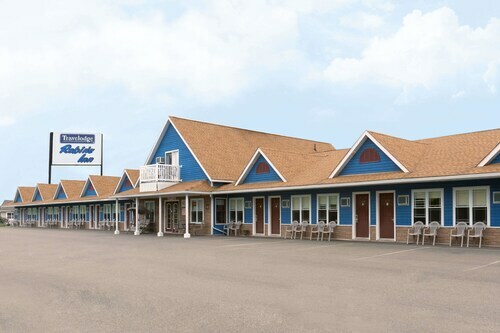 Situated in Fredericton, this motel is 0.5 mi (0.8 km) from Carman Creek Golf Course and within 3 mi (5 km) of Hyla Park Nature Preserve and Carleton Park. Bill Thorpe Walking Bridge and Gallery 78 are also within 3 mi (5 km). 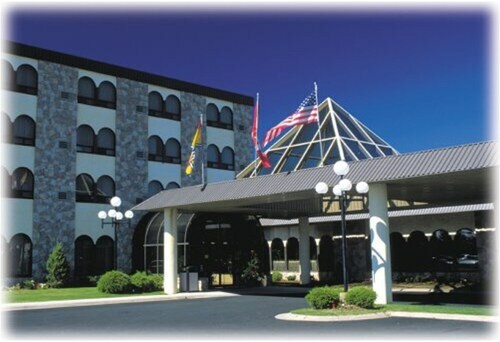 Located in the heart of Fredericton, this hotel is 0.2 mi (0.3 km) from Regent Mall and 1.6 mi (2.5 km) from University of New Brunswick. St. Thomas University and Aitken University Centre are also within 2 mi (3 km). 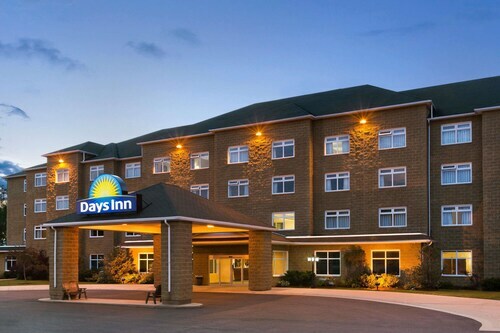 Situated in the business district, this eco-friendly hotel is 1.2 mi (1.9 km) from Regent Mall and within 3 mi (5 km) of Fredericton Golf and Curling Club and Odell Park. Fredericton Convention Centre is 4.4 mi (7.1 km) away.